I have a real love of birds which my daughter seems to have inherited, and also of Russian dolls. 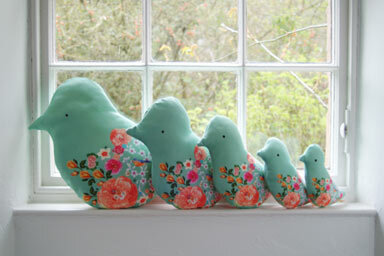 So how happy am I that I came across these gorgeous bird cushions by Clare Nicholson at Papa Stour! This beautiful 100 percent cotton set of cushions is available in mint green or chocolate brown (colours that are bound to go with most things) and are inspired by the ornate decoration of Russian dolls. 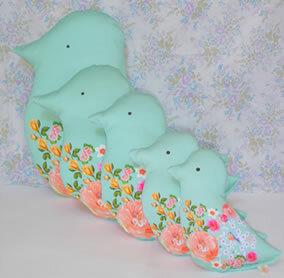 The set comprises five cushions with the largest measuring 14 x 12 inches and the smallest measuring 6 x 5 inches. Even if you don’t want to use them on a bed or couch, they’ll look just as beautiful on a shelf or window sill. A pretty inexpensive way to add colour and style to your room at only £88! Want to know more about the gorgeous products available at Papa Stour? Check out our previous review on booties, and these gorgeous chocolate baby blankets.